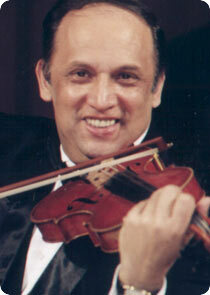 Antal Szalai is considered the best gypsy violin soloist in the world and the recipient of the coveted “Ferenc Liszt Award” in 2005. He and his Gypsy band have performed extensively worldwide at all major Concert Halls and Arts Festivals. This is their sixth Australian tour and the most extensive touring schedule, over 80 concerts nationally. Antal Szalai and his band of virtuoso soloists have put together a specially-created new show to coincide with a new international CD release. Antal Szalai comes from a family of gypsy musicians. He studied the violin at the Bela Bartok Conservatory of Music in Hungary, and then in 1967 joined the Honved Ensemble, a musical organisation which comprises a symphonic orchestra, a folk dance troupe, a choir and a gypsy orchestra. This ensemble was supported by the Hungarian Government and the Hungarian National Army. He became leader of the Hungarian Gypsy Orchestra in 1969. Antal Szalai explains the origins of the gypsy band: Gypsy songs began with primitive rhythms. About 300 years ago, the tradition of the gypsy band started and the band then comprised a violin, a viola, a cello and a cimbalomâ€. The traditional Cimbalom is a largestringed instrument in the zither category with trapezoidal soundboard. The strings are divided in a total of 35 groups that makes it possible to achieve a range of four octaves. This instrument allows highly skilled playing with articulated notes with very rapid staccatos. Their repertoire not only consists of the Hungarian Czardas music, but instead includes classical pieces the likes of Liszt’s Hungarian Rhapsody, Brahms’ Hungarian Dances, pieces from the members of the Strauss family, and traditional Hungarian rural folk music. Their earthy, native energy is destined to thrill audiences. Gypsies are noted for their sensitivity to music; the Australian audiences will be treated to a night of virtuoso showstoppers. The Gypsy way of making music is best explained by Antal Szalai: “The gypsies are very temperamental people……and gypsy music comes from the heart. There is a lot of feeling and it is romantic. Also, they play with a different sort of rhythm that is more interesting”. Come and hear the evergreen traditional Hungarian and International Gypsy melodies as well as some of the most popular highlights from the world of operetta. You will not be disappointed.